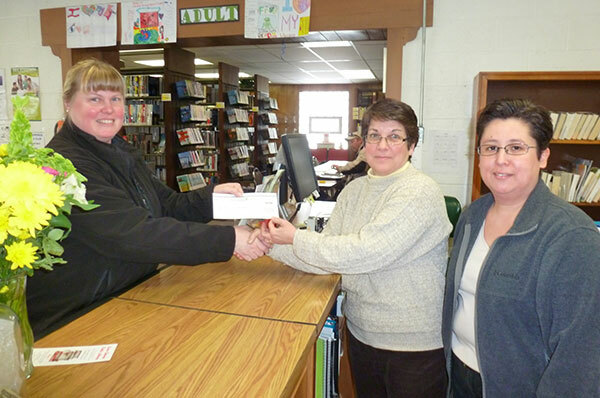 Tag Archive | "Modern Woodmen of America"
The Modern Woodmen of America recently presented a $500 matching check to the Cedar Springs Public Library as a result of the January quilt show. The youth group organized, baked and ran a fantastic bake sale and accepted donations to raise money for the Friends at the second annual Quilt Show Fund Raiser on Saturday, January 25. Modern Woodmen youth and parents were very engaged in all aspects of the Quilt Show from setting up to tearing down. Over the years the Cedar Springs Youth Group has conducted benefits for such projects as the Veterans’ Memorial Park, the Elmwood Cemetery, the Boy Scout cabin, the Cedar Springs Library (stainless steel drop box), the Nelson/Sand Lake Library (flag), winter hat and glove drive for Cedar Trails, light bulbs for trailer park residents on 18 Mile Road, Metron (flags), City Hall (baked goods for police officers), Fire Department (flag), Kent City Fire Department (flag), flags for Cedar View and the middle school, CS Garden Club (assisted in planting flowers) and they are actively seeking new projects. To find out more about the mission and how to request funds for your non-profit project, contact our very own Junior Director, Annette Nelson, at 616-240-4863. To email Annette, shrjanelson@yahoo.com.